Featuring some of Vancouver’s best patios with stunning views of Coal Harbour, Burrard Inlet and the North Shore mountains making Burrard Landing Vancouver’s premier outdoor dining destination. Panoramic views and highly-convenient amenities including food, retail, transportation and event space options – right in downtown Vancouver. The Vancouver Harbour Flight Centre, serving the Pacific Northwest Coast, including Vancouver Island. Including bike rental, fitness, beauty and gift. Click here to view our tenant directory. Burrard Landing is the retail, office and parking surrounding the perimeter of the Vancouver Convention Centre West in Downtown Vancouver, overlooking Coal Harbour and the Burrard Inlet. 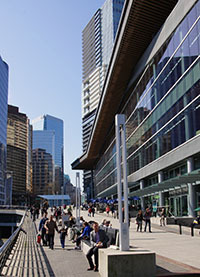 In addition to its direct connection to the Convention Centre, Burrard Landing is integrated with Jack Poole Plaza (home of the Olympic Cauldron), Bon Voyage Plaza next to Canada Place’s cruise ship terminal, and Vancouver’s world famous Seawall.